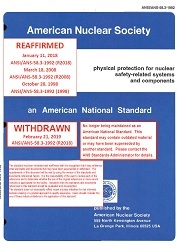 This standard applies to the preparation of technical specifications required by Title 10, Code of Federal Regulations, Part 50, "Licensing of Production Facilities," Section 50.36, "Technical Specifications"  for all nuclear power plants and provides the following: (1) A detailed conceptual framework which can be applied to the preparation of technical specifications. (2) Criteria for selecting subjects and values to be included in the technical specifications. (3) Criteria for developing technical specification bases.